Joe Wurzelbacher said he may run for Congress in 2010. 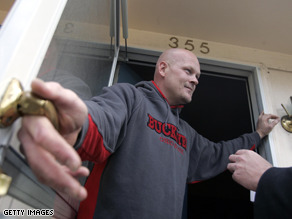 (CNN) - Could Joe the Plumber become Joe the congressman? Joe Wurzelbacher, the most famous plumber in America thanks to John McCain and Sarah Palin, told conservative talk radio host Laura Ingraham Friday he's considering a run for Congress in 2010. That would pit Wurzelbacher against longtime Democratic Rep. Marcy Kaptur for Ohio's 9th district on the state’s northern border, which includes Toledo and Sandusky. "I'll tell you what, we'd definitely be in one heck of a fight, Marcy Kaptur definitely has a following in this area," he said of the possibility. "But, you know, I'd be up for it." Wurzelbacher's chances would likely be slim. Kaptur has served in the district for 25 years, and remains a popular figure there. She won reelection in 2006 with nearly 75 percent of the vote and is expected to easily sail through another reelection this year. But Wurzelbacher, who gained fame after he challenged Barack Obama on his tax plan earlier this month, has attained a certain rock-star status in the Republican Party and his entrance into the race would likely be greeted with instant excitement and media coverage. "We support Joe the Plumber and people like him everyday with our support for lower taxes and energy independence," NRCC spokesman Ken Spain said. But a spokesman for Kaptur told CNN Wurzelbacher is already off on the wrong foot. "We just had another big layoff at the jeep plant, another 800 workers," Kaptur spokesman Steve Fought said. "So embracing Bush-McCain economics is kind of a strange way to launch your campaign. I'd have to question that strategy"
Wurzelbacher's comments come a week after a group of college Republicans launched a Web site with the hope of drafting him for a congressional run. Still milking the 15 minutes, so much for wanting the media to leave him alone. and you would still vote republican?? hard for people who believe in true democracy to understand! Joe check with your doctor! hope you have herlth care! I'm sure Joe the Tax Cheat, Joe the Fool, and Joe the Sham will back him wholeheartedly. He definately has enough flaws to run on a Republican ticket. Sign him up! I have to admit I'm confused about this whole "Republican" thing. Sam Wurzelbacher may have committed a crime by not paying his income taxes. Why is that OK? Why is it OK for a guy to practice any profession without a license? Is it because he's an American, darn it?To paraphrase Pat Buchanan: would the right still be deliriously in love with Wurzelbacher if he was an undocumented Mexican immigrant? Joe the Plumber and Sarah Palin. Welcome to the new face of the GOP. Even dumber than the old face. At this rate, the dems will be in office for about a century. After Palin/Plumber fails in 2012, the GOP will once again turn on itself declaring Palin a false Joe sixpack. Joe the Plumber will begin searching for his 2016 running mate and select Bob the Builder for a Plumber/Builder GOP ticket in 2016. Bush and Cheney cast ballots for McCain ............. how sad it must been to know that McCain and for sure not Obama would want their votes .... ouch. Joe, the unlicensed Plumber, probably shouldn't be working as a plumber never mind running for a seat in Congress. This guy is a real winner. OH well, comes to show anyone can be a politician. I love that slogan, he really should run with it. But other than that, what message is Joe gonna bring? what kind of platform is he gonna prop? Since he is poor, makes only $40,000 a year, and is self employed and struggling, I'm sure he's gonna become a very liberal republican. Oh well, GO JOE! just don't go off spouting crazies like trying to tell us the average american makes $250,000 a year or that people who do earn $250,000 a year are struggling. What a geek Joe has turned out to be......run for the sake of running. Hey Joe, have you finally figured out that McCain's tax policies will only benefit Joe the CEO? Agreeing to run against an incumbent democrat shows that you wouldn't vote for Obama even if he said you woud pay zero in taxes. Oh, and when you buy that plumbing buisness, good luck getting a loan. The credit markets (if you have credit...see $1,000 owed in back taxes) are dried up. James Madison, Alexander Hamilton, Thomas Jefferson, Ben Franklin are all rolling over in disgust right now. We have lost our way soooo badly. Let's get back on track and vote Obama in. Sarah Palin & Joe the Plumber, now there's the ticket. He's a big liar – he'd be an awesome politician! How about Thomas the Tank Engine? Sure to score high on security issues, since his middle name is Tank. We're all a bunch of idiots. Joe sounds like the perfect candidate for another bs soap-opera campaign from the republicans. He is following McCain's footsteps, just like McCain is following in Bush's (failed) example. What makes this guy qualify to run for an elected office? Did even he go to college and I don't mean driving by or thru one! 15 minutes of fame is gone thru Joe the Idiot, Joe the Tax Evader head!